Supercell is a Japanese music creator group born in Nico Nico Douga (video sharing site), and consists of a composer and lyricist Ryo and illustrators. Currently, nagi sings the group’s songs as a guest member, but originally the group used a vocaloid (singing synthesizer software) Miku Hatsune for the vocals. 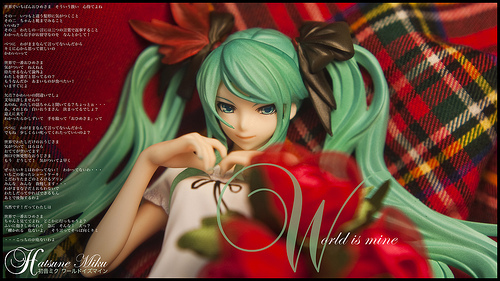 In December 2007, Ryo posted his music “Melt” using Miku Hatsune on Nico Nico Douga, and it became really popular among the users. Since then, he teamed up with illustrators to create music videos for his music, and sold copies at anime and manga conventions. Ryo explained that how they met was like playing basketball in a park and all kinds of people joined together because it would be fun. In March 2009, Supercell’s first major album “supercell,” which was awarded the Gold Disc for having exceeded 100,000 copies sold. In August 2009, their debut single “Kimi no Shiranai Monogatari” was released, and used as the ending theme song for an anime series titled “Bakemonogatari.” The song was also awarded the Gold Disc. Their 2nd album “Today Is A Beautiful Day” is announced to be released on March 16, 2011. Since Supercell’s base and starting point is a video sharing site, they are very open for derivative works stating “Use our creations however you want as long as you don’t do it for profit. It’s our honor as creators that people make derivative works using our creations.” In fact, there are many creative videos based on Supercell works on Nico Nico Douga. Autumn the Season for Reading!? Let’s Make Traditional Japanese New Year’s Food, Osechi! !